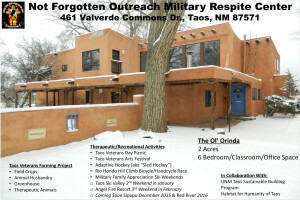 The Not Forgotten Outreach Military Family Respite Center Taos, NM, is a place for Military Families to come together for up to a week free, and help each other reintegrate into society. The “Ol’ Orinda” is a place of respite, calm and peace, allowing Military Families to address their mental health and cognitive needs with others who “walked in their shoes” after returning from war. By providing an outdoor, rehabilitative retreat that promotes peer connection, challenging outdoor experiences, and healing with other Veterans, Active Duty their Families and Gold Star Families. The Not Forgotten Outreach Military Respite Center will also serve as a central location for Not Forgotten Outreach’s Taos Veterans Farming Project. The 2-acre parcel will be a working Farm, with a heated greenhouse, farm animals and field crops and the Teaching facility for a USDA grant “Beginning Farmers/Ranchers Development Program”. The 2nd Floor will be COMPLETELY Wheelchair Accessible, giving disabled individuals the best view in the house. One (1) room will be accessorized with a Lift and Care Systems, ceiling track rail, changing course easily in three directions, allowing people with reduced mobility to move from wheelchair, bed and bathtub. Second floor will be accessible via an elevator. UNM-Taos Green Technology program has taken on the Military Family Respite Center as their class project, to improve accessibility as well as energy efficiency. Kit Carson Telecom is donating fiber optic internet service. The Town of Taos through New Mexico Division of Veteran Services has donated a commercial kitchen vent-a-hood system, commercial dishwasher and stove. New Mexico registered Architect Ned Cherry R.A. will provide Architectural Consultation services as an “In Kind” donation for the proposed Military Family Respite Center for up to $20,000.00 (Twenty Thousand Dollars. We look forward to all the wonderful improvements and Ribbon Cutting for the “Grand Opening” of the Military Family Respite Center on 07 July 2016 by welcoming the 1st Military Family to a free five (5) night stay in our Historic and breathtaking community of Taos. To accomplish the remodeling task, it is essential to raise, $124,000.00. Local contractors and construction supply companies are donating their time and supplies to offset the remodeling cost. A special thank you to the UNM Construction and Technology Department, the UNM Green Technology Program, and the UNM Sustainability Institute. Kym Sanchez, President/Founder of Not Forgotten Outreach, Inc., dream comes true today, Friday 13th Feb 2015, when she takes ownership of the “Ol’ Orinda” in Taos, NM, where she will open the Not Forgotten Outreach Military Family Respite Center. Kym Sanchez, founder and president of Not Forgotten Outreach, served as the Casualty Assistant Non Commissioned Officer In Charge (NCOIC) 1st Infantry Division, Divisional Headquarters in Iraq in 2004-2005, her duties included burying over 180 soldiers. She also buried her husband, SGT Timothy Sanchez, who was killed in action in 2007, in Baghdad, Iraq, whom the non-profit is dedicated in Memory of. Kym’s extensive first-hand knowledge of the emotional trauma of military families invigorated her to form the 501(c) (3), Not Forgotten Outreach; with the mission of providing therapeutic and recreational activities for Military Families. Since conception in Feb 2013, Not Forgotten Outreach provided programs for over 4,403 Military Families members. The Not Forgotten Outreach Military Respite Center Taos, NM, is a place for Military Families to come together, and help each other reintegrate into society. The “Ol’ Orinda” is a place of respite, calm and peace, allowing Military Families to address their mental health and cognitive needs with others who “walked in their shoes” after returning from war. By providing an outdoor, rehabilitative retreat that promotes peer connection, challenging outdoor experiences, and healing with other Veterans, Active Duty their Families and Gold Star Families. While staying at NFO’s Respite Center, Military Families will have the opportunity to share strategies for overcoming obstacles while building the bonds of fellowship and friendship. Not Forgotten Outreach thanks Bank of America, University of New Mexico Taos Construction Technology Dept. and the UNM Taos Green Technology Program, Phoenix Mechanical, the Military Families and the Community of Taos, New Mexico for their support is project of creating a home for Military Families in Taos, NM. Not Forgotten Outreach, Inc. a 501(c)(3) is dedicated to motivating Military Veterans & their Families and Gold Star families of fallen warriors to participate in recreational and/or therapeutic activities in order to facilitate the healing process. Providing opportunities to improve relationships, build comradeships and at the same time enhance personal well-being. University of New Mexico Taos Construction Technology Dept. UNM of Taos Sustainable Agricultural Dept.